Sie sind hier:UHH > WiSo-Fakultät > Fachbereich Sozialökonomie > Professuren > Chair for Organization Studies > Team > Philipp Darkow, M.A. Since October 2015 Philipp Darkow is a doctoral researcher at the Chair for Organization Studies. His dissertation project centers around organizational resilience, network resilience and crisis management. Prior to taking up his position, he graduated from Universität Hamburg and holds a master degree in `International Business & Sustainability´. During his master studies he already worked as a student assistant at the Chair for Organization Studies as well as at the Center for a Sustainable University. Together with other students he initiated the `MIBAS debates on CSR´, a series of panel discussions which takes place twice a semester and brings together students and practitioners to debate on latest challenges in the field of sustainability and CSR. 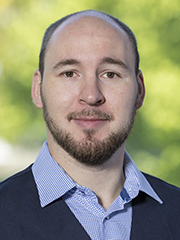 Philipp Darkow attained his bachelor degree in `Public Management & Governance´ at Zeppelin University Friedrichshafen, where his scientific interests focused on public administration and lobbying practices of local and regional NGOs. During his studies he worked as a student assistant at the Chair of Strategic Organization & Finance (Prof. Dr. Jansen) and the Civil Society Center. Besides, he joined the junior consulting enterprise Spread the Word where he developed marketing and product concepts for societal initiatives and NGOs. Together with fellow students, he initiated and supervised a lobbying campaign, advocating a local infrastructure project which raised wide media coverage during the state election campaigns in Baden-Württemberg 2011. He acquired further practical experiences during internships at the Federal Ministry for Family Affairs, the Körber-Foundation, the Federal Ministry of Foreign Affairs and Deutsche Bank AG. Darkow, P.:”Beyond “bouncing back”: Towards an integral, capability-based understanding of organizational resilience”, in: Journal of Contingencies and Crisis Management, 2018 DOI: 10.1111/1468-5973.12246. Darkow, P.:“Making Space: The Role of Spatial Practices in Managing Refugee Camps“, AMOR Colloquium at Viadrina University, Frankfurt/O. 2018. Darkow, P.: “Coordination Saves Lifes: The Emergence of Coordination Practices in Unstructured Terrain”, 3rd Northern European Conference on Emergency and Disaster Studies, Amsterdam 2018. Darkow, P.: "Managing for Resilience - Emerging Coordination Mechanisms in Emergency Response Operations", Conference on Humanitarian Logistics at Technische Universität Dresden, Dresden 2017. Darkow, P.: "Managing for Resilience - Emerging Coordination Mechanisms in Humanitarian Emergency Operations", AMOR Colloquium at Technische Universität Hamburg-Harburg, Harburg 2016. Darkow, P.: "Bouncing Back from Crises: A Practice Perspective on Organizational Resilience", PhD Pre-Colloquium Workshop at 32nd EGOS Conference, Naples 2016. Darkow, P.: "Regionale Partikularinteressen: Blinder Fleck auf der korporatistischen Landkarte", in: Schatilow, L. (Hrsg. ): "Lobbying für die Provinz - Regionallobbying in Theory und Praxis", polisphere, Berlin 2012.
International Organizations: Structures, Processes and Culture, M.A. Seminar: Managing Integrity: Compliance and Responsibility, M.A. Studienprojekt zur Personal- und Organisationsforschung, M.A. Qualitative Methods of Empirical Research, M.A.